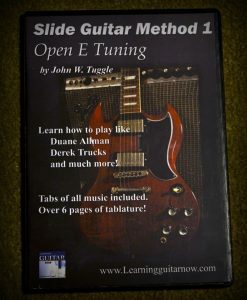 This week marks the 10 year anniversary for the release of my first ever DVD video course Slide Guitar Method 1 Open E Tuning. This is the course that started it all for me and was the catalyst that led to this website being my full time job for 10 years now. It’s crazy how time seems to fly by so quickly as it doesn’t feel like it’s been that long ago since I was filming that very first video. Things have changed dramatically since Feb of 2008 but one thing I have tried to continually focus on is making the lessons better and better every single year. I can’t say whether or not I have accomplished that but I sure have put forth a lot of effort in the past 10 years to make that happen. You can be the judge whether or not I have made the lessons better. I would also like to thank every single person who has watched a lesson in the past 10 years whether it be free or paid. Without you guys there would not be any website at all right now. Next I would like to send an extra special thank you to everyone has purchased lessons over the past 10 years as it is you who have allowed me to continue to make a living doing this and also to keep investing in more equipment to make the lessons better and better. I can’t thank you enough how much this means to me that you guys keep purchasing lessons and subscriptions. It’s been a dream come true for me to be able to do this for a living full time. With the 10 year anniversary of Slide Guitar Method 1 Open E at hand I decided to put out a new course that focuses on open e tuning. I thought it was fitting since that’s how this website started and the reason I am here in the first place. It was also the Open E Tuning slide lessons that Gibson liked that I put out on YouTube that led to them using some of them on their website back in 2008. 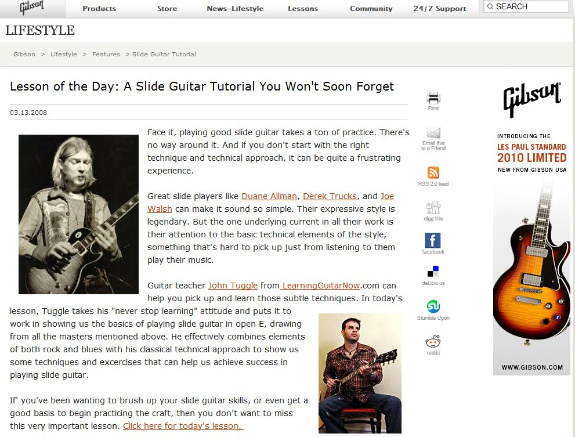 It was an amazing feeling to know they thought my lessons were pretty good and also to put me and my favorite slide guitar player on the same webpage. That was an unbelievable moment when I first saw that and a feeling I’ll never forget. After thinking about all this it was even more apparent that I should do something about Duane Allman Slide guitar for this 10 year event and that’s exactly what I have done. For this 10 Year Anniversary I went back and listened to a lot of my favorite Duane Allman open e tuning solos and started going about putting this course into place. The material started coming really quickly and I knew this was going to be a great course in my mind. Whether or not other people will enjoy it still remains to be seen but it has passed my standards and ultimately that’s all I can do. For this 10 Year Anniversary Special I’ll be giving away 5 FREE Download versions of the NEW Play Like Duane Allman Slide Course. You’ll also receive Slide Guitar Method 1 Open E Tuning the new version that was re made back in 2011 then updated again in 2014. Congrats to you guys! And THANK YOU for all the amazing posts about how my lessons have helped your playing. It’s truly a dream come true to see how many of you guys have really enjoyed them. Here’s to the next 20 years! Fun, easy to follow no-nonsense guitar instruction. Gives me the confidence to continue to learn. Thank you! The Duane Allman lesson for Not My Cross to Bear is great. I can’t wait to try the slide lessons! John’s lessons greatly help to demystify the difficult nuances of great slide guitar techniques. I must be honest. I have really enjoyed your free lessons on my favorite, Duane Allman. Also Dickey Betts, and other blues lessons. Duane is the reason I started playing guitar! For me he is the best guitar player ever. His slide playing has never been equaled. He had the touch, and everyone else, well, I should be polite. I’ve spent a little time with the Eric Clapton lessons and he really catches the pieces that make Clapton, Clapton. Slide guitar had always seemed a mystery to me until I discovered John’s lessons. He broke down the technique in a way that was so easy to digest and learn from. He’s a great guitarist and the best instructor out there! Well, you do it right, little less conversation and some more playing! and you go to the target and helped me to achieve my goals! You are a good teacher. Great teaching style. If you put in the time you will get great results. Great guitar Lessons and easy to learn! John is my go to guitar guru. I have learned so much about all aspects of guitar playing such as playing in open tinnings and slide to different styles of my favorite players from his emails with free short segments than any other source. I always check out his emails and bookmark the lessons in them so I can go to them at any time. I just stared with these lessons and they’re great! Can’t wait for more to come! Well, I thank the good Lord that I have been allowed to live long enough to find and buy your slide guitar lessons. After first hearing Duane Allman play slide guitar in the 1970s I began an ongoing course of self instruction on how to play slide, finding everything I could for slide guitar courses, of any type; reading in music magazines whatever I could find, had a machinist make my first metal slide for me, asked other musicians that I knew to tune my guitar to open E, and began my right hand finger training for the strings, among other things. My purchases of your courses have been a great encouragement to me to continue to learn how to play slide guitar. I hope to pass on to my 4 year old grandson what I know, and what I have learned from your courses, about playing slide guitar so that the next generation can continue to carry the torch. Best wishes and congratulations on your musical anniversary. I am still new to the slide game, but thanks to John I have a much better understanding of “how” to play slide not just a small library of cool riffs. John’s courses have really helped to open up my playing style with and without a slide. Have not heard about your training. Could use slid guitar training. Hey John I’m thinking about joining the all access pass. I’ve seen your POD casts and they seem very well done. I like your style of teaching. Clear, always to the point and musically and technically proficient, John is a first class teacher ! His video lessons help you to really grow as a guitar player and – at least as important – as a musician. John’s instruction is clear and concise, and he makes the best use of visual technology. What he teaches is professional level music, not some made-simple, anybody-can facsimile. His success is in breaking it down into the uncomplicated fundamentals. Duane Allman has been a guitar hero of mine for many years. I signed up for the Open E Tuning Solo class, but it only covered that one song (which I loved) but try as I might, I was never able to get the same sound as you did. I know that you offered a more extensive course that covered the proper techniques for playing the slide and it would mean a lot for me to be able to go back and take another crack at it. At 74, I may be one of your oldest students, but I play my guitars every day and would love to be able to add a slide to my repertoire. I used to think it took some sort of black magic to be able to play slide guitar. John’s instructional videos take this art and make it approachable but more importantly make it fun to play in the style of many of the blues greats. His videos have definitely taken my playing to another level and I always look forward to what he’s cooking up next. Have loved the lessons – concise, easy to follow and useful is my own playing! The Open E lessons have been great. I always wanted to play slide, but couldn’t figure it out. Your lessons made things crystal clear! Thanks! All of John’s lessons have boosted my playing and understanding of the guitar. The Clapton series were super and I got the most from the Blues Guitar Method course and Techniques. I could spend all day identifying high points to the various courses I’ve purchased from John but in the end, it was money well spent. Thanks John and keep up the great work. I use many of your licks either straight or modified all the time. Learning Guitar Now has helped me a lot in becoming a confident blues guitar player. Not only I’ve purchased and masterd Albert and Freddie King Style lessons but also the lots of free lessons, vlogs and jamtracks have helped tremendous in my timing skills as well as in my phrasing en lick vocabulair. Thanks a lott and please continue! Lex from The Netherlands. Congratulations to ten years for helping people like me play like we mean it. Here’s to ten more. I bought the Open E slide course many years ago and liked it so much that I bough ALL your slide courses!! 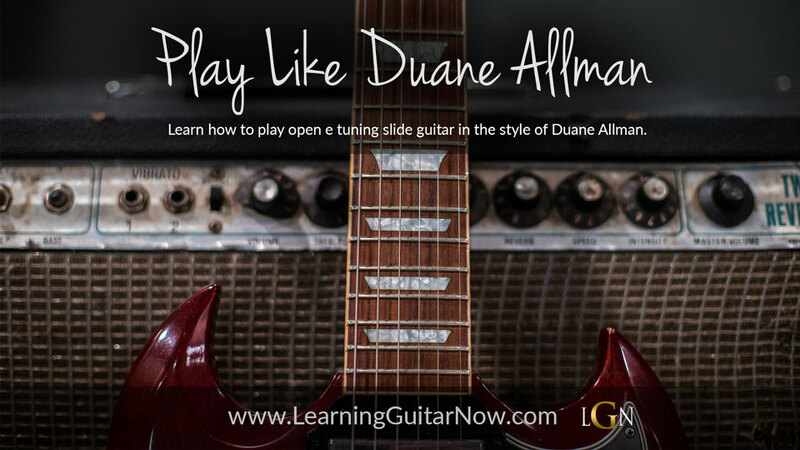 I would love to see what you’ve done with a course on playing slide like Duane. Looking forward to winning your free “play like Duane” lesson. Let me say, I have been following you for years. You and two other folks that teach online are the best three in the world. It’s been a long time from the first video I saw from you. And I still think your lessons are between the more accurate and professional without to lose anything of the spirit of the blues. One of the things that I really loved was that for the first time I saw the bars sliding along the video. I wish you another 100 years of great lessons!! I would have given up on guitar if not for Blues and Slide DVD lessons. Their the best. 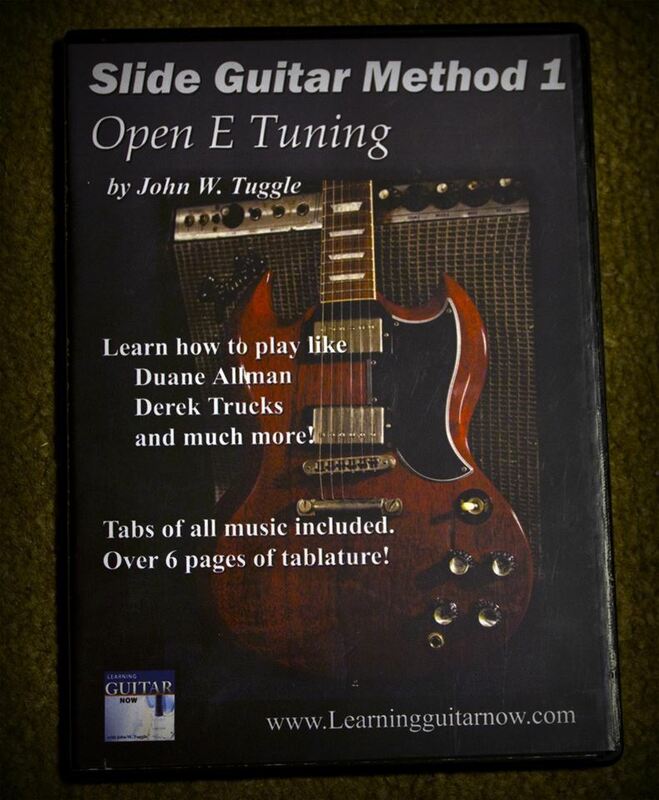 As a lover of Duanne Allman work on slide guitar this lessons came to me as a open minded gift. To have someone given all theses chops e riffs in detail helped to my development amazingly, thank you, #lessonsforlife!!! Straight forward lessons. No guessing on what comes next. Not a showoff, just teaches and gets the point across. I have no problem in buying John’s guitar lessons. John can play and that is no doubt but he can teach too! That is what draws my attention to his lessons. Looking forward to the next 10 years. from how to vibrato properly to understanding a 12 bar blues. rocketed, my peformance has more than doubled and i have much more confidence. Thanks to you. I tell everyone i talk to about your courses. I learned more in two years with your lessons John than in the last 30 years wondering aimlessly with other lessons. The lesson breakdowns and tablature are awesome! Thanks again John Tuggle. Hey John: Am enjoying all your tips. Been a while since I played but your instructional videos have sparked my interest in guitar again. Thank you! John, I have been following your lessons since the start. I decided to purchase lessons because first off you are a player, then I learned that not only do you have the ability to play, but you also have the gift to teach. I’m a 50 something weekend warrior, and your courses have given me the skills, and understating of the fretboard, that have allowed me to be the player I have always wanted to be. For one, you’re lessons are done in a way that novice’s such as myself can understand, I also like how the lesson can be slowed down as to see finger placements and you’re easy to understand explanations on how to play a particular riff. I purchased several guitar courses, but I find that yours have been the most helpful. Not long after I got the first course, I began to take a core guitar course that had 9 – 8-week sessions. At the same time, I was taking your courses and I found the ‘blues in a certain style’ or ‘blues in a certain key’ to be the most helpful. I’m a lot better than it was and I started to still want to get better. I never have purchased the Duane Allman course, but would love to have it. Your courses are sound and well explained, at first, I was tempted to say simple but they are not. Their straightforward and it is easy to understand what the objectives are. Thanks for your courses! Congratulation John. I’ve probably followed the entire ten years. I’ve got a library of your lessons on my computer and have learned a ton of phrases I’ve wanted to know since I started playing. Especially Eric and Duane. You are the best with these two hero’s of mine. Your lessons have always been to the point. Just the right amount of verbal explanation. So much useable information. Congratulations on your success! Ten years is not easy to do! The Freddie King and Albert Collins style lessons were amazing. I used the Freddie King lesson to build a solo for me to cover Same Old Blues (as by Freddie King). The Albert Collins solo still challenges me to this day. I’ve bought many of John’s courses from the “how to play like” and the “blues methods” series, all of which have helped me enormously. His no nonesense approach to teaching makes things easy to follow and straight and to the point. I have progressed from a very average player with little knowledge of technique and theory, to a well rounded guitarist, with a confidence in my ability to improvise,knowing what to play and why I’m playing it. Been using these courses for many years and they are among the best available! My playing has really improved with John’s lessons including Play Like BB, Slow Blues Supplement, and Shuffle Blues Supplement courses. But the one I keep returning to and benefiting from the most, each I revisit, is the Blues Guitar Method 1. I will probably reference this course for the rest of my playing days. It has taught me more about the fret board than any other material I have come across. John, I guess the thing that has helped me the most is your teaching method. Besides being soft spoken, your lesson have helped me reach new goals in my playing. Most of all however ,is your commitment to passing on to others the music of Duane Allman. He was and still is in my opinion the greatest slide player. I look forward to many more lessons! John’s videos are simply beautiful. They are vivid and a delight to watch. The instruction is also super clear. In terms of sight, sound, and instruction they are without peer. John’s Eric Clapton lessons are amazing. I could never have even come close to nailing these licks without John. His lessons are simply the best. Thank you so much. After giving myself an overuse injury I was unable to play by conventionally fretting. Slide was my lifeline and kept me connected to the instrument. John’s slide courses are tremendous; fun, informative and easy to follow. Thank you! You’re a lifesaver. It’s like a little adrenaline kick getting a lesson from John. It reignites the interest level and stimulates more practise. Super instructor, has a way to make is teaching easy and fun and communicates efficiently. I started getting into slide guitar last year in December. I had no idea where to start. Duane Allman and Derek trucks of course were the inspirations but where do you go to figure out how to play like them? I found John around January and I purchased the “Open E slide course” as soon as I got the money. He taught me everything I wanted to know: how to position the slide, the scales, some cool slide licks, etc. I spend hours and hours on these videos and I seriously couldn’t believe how good I was getting in slide thanks to that course. Now about a year later, I have been called one of the best slide players around my music scene and literally it was because of John and learningguitarnow. John is an inspiration to all and I really hope this Duane Allman course will set myself up higher for my playing abilities whether that be slides or just regular soloing in general. Thanks to John, my band has gotten a manager and we have been asked to play all around the Nashville area. So thank you John for everything you have done for me, my guitar playing, and my life. John is a great all-around guitarist and a natural teacher. I don’t know of any site quite as helpful, especially in terms of the nuance of slide guitar. These courses have been such a great help to me in my development as a guitar player. I’ve been playing for 40 years and are always learning new things . Thank you. Play as Eric Clapton, brings me an all understand the way that he use a tecnics on his solo. With so many hundreds of video guitar lessons out there it really is not easy to understand why one presenter may be head and shoulders over the rest. First of all Learning Guitar Now’s presenter, John Tuggle is sincere and direct in his approach. There is no ego getting in the way. There is no ” flash ” getting in the way. His approach is authentic and his chops are proven. This is how Learning Guitar Now has helped me. Above all the notes / positions / techniques involved John has taught me how to approach the guitar as a musical instrument, as a challenge and as a friend. Have found a great way to continue to learn more slide techniques. Have PTSD after a untreated stroke and playing slide on my old Yamaha acoustic ( as well as a vintage 1967 small suzuki that has been refinished), helps relieve anxiety like nothing else! Hope to go electric some day! I use the term “secret weapon” a lot when buying guitar gear. I use these same words “secret weapon” when referring to your guitar lessons. Your lessons always take me to the next level. They truly are a “secre weapon” for me. Keep them coming!! For learning slide there is simply nothing better out there than John’s lessons – nothing comes close . After a little effort to learn the techniques I am able to produce sounds far more emotional and soulfull than I ever was playing standard. Rub John’s courses I’m relatively new to playing Blues although I’m a Blues lover. John’s courses are laid out in a clean methodical way. Makes them easy to follow and extract all the little gems that lie within. I purchased the Master Slide Bundle back in 2012 – that included the open E tuning course, open G, standard tuning, and then one open E solo. As a musician, one of the most important things that can happen is a removal of the mental “block” that keeps them playing in a box. John’s slide lessons served the function of opening up the fretboard and giving a different approach to playing fretted guitar as well. Through the years, I’ve purchased the next major open E course, the BB King, Clapton, and Warren Haynes courses. One of my favorite things about John’s courses is the fact that I can always return to them after working my way through the play along tracks and individual lessons. There’s always some musical knowledge to be mined – at every stop along the way. John a superb E&G slide guitar teacher. I am a former EMI and Atlantic recording artist and I have been a professional guitar player for over 30 years. The things that I have learned from John’s lessons make me a better player, song writer and overall musician. I find johns influences all over my playing and I am greatful to have followed him and learning guitar.com for nearly ten years. I have purchased, slide, blues, Warren lessons and find something new every time I watch them. I will continue to learn. Thanks John. Congratulations John and thank you for 10 years at it!!!! Dude you one an outstanding teacher! You not only provide the technical wizardry (the camera angles, the scrolling I, IV, V chords and slow motion helps) you helped me to understand and play blues and Allman licks I never thought I could play! From bends, pull offs and chord embellishments and so many other techniques I have made great progress in learning guitar and I have really enjoyed the journey so far!!!! Thanks for first class teaching! Looking forward to the next 10 years!!!!! Your lessons are the type of music I like to play, you have all the bases covered, you are a great teacher and an insperation, great work. For anybody interested in learning electric slide guitar John’s course E Tuning Slide guitar must be the most comprehensive course out there! Easy to follow and you can move your skills forward with his lessons. The Warren Haynes lessons were really comprehensive, informative and instructive. Looking forward to taking the next step. I just want to say thanks to John for having this site. I was lost in my guitar playing/learning journey and when I found John’s site it all came together and I know have been a dedicated open E and with John’s help I continue to develop and make monthly progress. Thanks! Not your typical course. You not only learn how but why. You learn to take time to breathe like a singer. When it comes to playing like a artist John has taken the guess work out of it. You learn not just their licks but mannerisms. Who knew Clapton bends notes differently than Haynes. When it comes to slide there are no words to describe how in depth these lessons are. Thanks for the time you have spent to help an old hacker like me. I’m forever grateful. I have to start by saying that John is not only one of the greatest instructors on the internet today but one of best ever. He not only presents very accurate lesson material, not only does he break it down really well and helps students to understand it but he has the ability to present it with the true feeling of the blues and the feeling of the artists. I’ve seen Dickey Betts, Warren Haynes, SRV and Clapton play live and the lessons that I’ve worked thru from Learning Guitar Now has been accurate and you come away from watching John’s lessons as if you were learning from the original guys. There is no one better than John for sharing that with his students. Good to know,that 10 years ago you guys ,had this good idea. to share precious lessons for us aspirants to be a good blues guitar players. I’m not too old on playing guitar ,but early I felt the necessity to put my hands on good instructional lessons to help me out along the way and come across with this gem lessons .thanks guys for the support. My great gift for you is to put my hands in this instructions and get down to work on it ,and play better everyday. I’m Brazilian and I need a course like this to learn. Slide makes rock..drives the storyline. I push it more confidently..
I’ve not found any lessons on the Dark Art of slide guitar that explain it and break it down as well as Learning Guitar Now. John’s lessons have taken my playing from sounding like a cat trapped in a well with a wasp’s nest to at least sounding like actual music. Only reason I’ve never bought the course is lacking the time to do it justice. Thank you John for having this site. It helps me a lot to covering blues solos. I follow you from Italy. Hearing the music of Robert Johnson led me on to listening to Elmore James. That made me want to learn slide guitar. I tried and tried to no avail and gave up. I discovered lessons on youtube and eventually watched John’s via the web. They are explained in a way I found easier to understand and use. The lessons have given me the motivation to have another go at slide. I’m no expert but at least now I can play some, enjoy it and want to learn more. Thanks John. John, a huge and big Thank You!!! Your courses are great, I can do some nice slide licks! Never found something better! Congratulation John. Great guitar Lessons and easy to learn! Hay John, really love all your lessons and I would love to win these lessons, maybe one day I will be able to play like you. Blues method was the catalyst that took me from an average bedroom-player to playing monthly gigs across 3 bands. The content was well delivered and thought thru making it easy to follow. The confidence the blues lessons gave me inspired me to move forward in not just the pentatonic/blues scales but further into that unknown like moxolydian and dorian. It was John’s approach to thinking about guitar that laid the foundation for the learning that was yet to come. Thanks John! The slide series got me through the toughest time in my life. I always wanted to play slide , last February my mom passed and I didn’t know what to do with myself , so I found myself spending countless hours just absorbing everything from each lesson and saying it helped me would be an understatement. Although the lessons on the 3 Kings brought me into your website, no one hardly teaches slide. I have not been doing lessons lately, but slide is about all I play now . Thanks John, for 10 great years and keeping the flame going. I bought your DVD ‘s ten years ago and still go back to them !!! GREAT STUFF !!!! I have only been a member for about a year and a half and found out about LGN from seeing a video on youtube. I thought right then that this guy has a real gift for teaching guitar, and I joined LGN right then. The pace, content, and instruction techniques are so helpful to me. The closest I ever saw before this were some DVD’s by Arlen Roth (who interestingly enough I think has been featured by Gibson too); but your teaching to me is in a league of its own. I also appreciate the interactive sessions and, though I haven’t taken advantage of it, your forums to answer questions. I also think it is GREAT that you are adding new material all the time. To me it is apparent that you enjoy teaching and wanting to help people become better musicians. Thank you, John, for your wonderful help. Nobody does blues lessons on the internet like John. Learned a lot from the many courses I’ve order from him in the past. Just awesome! Because you’re the best thing that ever happened to me !! It’s so difficult to find good informatión about slide technics. I’m very happy with the courses. Long life to the LGN site. Congratulations John!! For someone who wants to learn the blues, John’s lesson are the absolute perfect blend of theory and practice. John creates tunes that are fun to play again and again – that are in the style of incredible musicians like Duane Allman, Derek Trucks, Clapton, and Dickie Betts (to name a few). There is just enough theory to know why you are playing what you are playing and to improvise on your own, but not so much that it is overwhelming. The instruction is crystal clear and there are tons of materials to help you master songs and techniques. When you have a question for John – his responses are quick, thoughtful, and helpful. John is the best blues guitar instructor on the internet. great lessons ,helped my playing so much .Best blues lessons anywhere. John has helped me take my playing to new levels. I have played with lots of people but I have picked way more by following John’s lessons and just watching his style of playing. As a non-professional, adult guitar player, I’ve learned in all different ways: playing with friends, taking classes in-person or online, studying YouTube videos of my favorite songs. All of these things make me feel fulfilled and happy. But when it comes to actually getting better, it takes consistent, sustained, focused effort over a long period of time, not just doodling around to your favorite songs. John’s videos are the thing that most motivates and enables me to put in (nearly) daily practice. The Slide in Open E course is a perfect example in that it was right at my level – I started at the very beginning, set my action higher, got Boomer 11s, took my time getting comfortable with the R and L hand basics. I never am in a rush to get to the next section or example because it seems to be very personalized to my interest and ability. I especially like the short licks. Playing them over and over has improved my comfort and tone a lot (though I think the rest of my family prefers that the amp not be cranked as much as I tend to want to). The approach of playing the riff, slowing it way down, showing the tablature in real time, and then breaking it into bite-sized morsels is exactly what I need and enjoy. I also endorse the Chord Embellishments course. It has allowed me to play more interesting parts when I’m in an ensemble and is responsible for blowing my mind – better late than never – with the understanding of how chord shapes can be cycled up the neck C-A-G-E-D. I am grateful that the internet led me to Learning Guitar Now. It has been an inexpensive an inspirational investment I’m glad I made. videos my playing has improved greatly. Great lessons. Such an excellent resource. Joining LGN has helped me tremendously. John has a great teaching style and his playing inspires me to be a better guitarist. I am a long time guitar player, but never played slide. I had no idea where to begin. Then, I saw your YouTube videos and knew you were the right person to teach me. Thanks to your slide lessons, I’ve hit the ground running and play tons of slide songs in my band. Thank you for your lessons! I really like the layman’s approach to your teaching, it feels like you’re sitting with a jam friend and he’s getting serious and really showing you something useful. Combine that with the tools provided on your site ( slow-mo play-through, tab play-through, video looping in/out points, and tab download), and you have a comfortable and repeatable teaching environment. Nice work! john your teaching methods are of a top of the line musician. you know how to show all the intricate’ s of an artist technique and get it across so it’s fully understood. you always teach the do’s and don’ts of playing guitar correctly . also you give great pointer’s to make something easier to perform. John is among the very best teachers I’ve found. His courses have improved my playing significantly. He leaves no stone unturned when he breaks down concepts, and the course materials are so helpful. I can’t believe how much progress I’ve made since I started using your courses John. The ideas are so clear and you explain them so simply. Stuff I’ve struggled with before now makes sense and I feel for the first time I understand what I’m trying to do. Thanks to you I’ve found the confidence to join a band and start gigging regularly. My big regret is I didn’t find LGN sooner and wasted so much time on other things that didn’t work. And your site is an absolute treasure trove of great things to learn. You have taught me to play with confidence and how to achieve great tone. Your videos combine camera angles that make learning easy and you correctly anticipate what (me) the student needs to work on to be a better player. I have purchased quite a small library of your DVDs and I am very grateful for you, John. Thank you for all that you do. I’ve been playing guitar since 1970, mostly by ear and learning from friends, always loved the blues!, since taking John’s course I’ve learned more in the past year than ever before! Thsnk you John. Gostaria muito de ganhar este Play Like Duane Allman Course! aqui no Brasil não se encontra material bom como este! Signed up for your lessons mainly for the “Play Like Dickey Betts” series which i downloaded and studied. I would record the cord progression of the Whipping Post rhythm on my looper, used the licks i learned from your lessons, and then soringboard into my own improvisations. This was a big help. I also have a resonator usually tuned to open E to play Little Martha. Your latest lesson for open E would be a great addition to build my skills on that front. My want to play slide guitar came about over 10 years ago. I’d say about 14 or 15 years. Back then I remember looking up slide guitar on the internet and coming up with websites that only TALKED about it but never showed you how. I gave up. Checked in a couple years later, there was more, but barely anything at all. Still just sites talking about it and then, there was some tab and examples and even more books with CD’s on the subject. But never anything on technique or nothing to build off of for emulation. I gave up the search again. It wasn’t until 2014 when I decided again I really wanted to play slide and I was really going to do it. Typed “open e slide guitar lessons” into Google and your website popped up. Looked at the video demo for your master open e tuning slide bundle and I was sold. Showed my wife because I was so excited (she could care less haha) and bought it that night. I loved how in depth it was and all the ways you’d teach it, especially the play by play on the licks for each example. A couple years later I bought your standard tuning slide course for the fun of it. I guess whether you pick me or not, I just want to say thanks for putting in the time and putting a nnore than fair price on an awesome skill and style of playing! Congrats on making it this far! Great lessons, I just love them! Helped to improve my guitar skills. I like the way you explain everything. Thanks John! Congratulations on the 10 years your lessons have helped me improve my guitar skills slide and blues. Look forward to the new ones. Your guitar playing, tone and explanations of the lesson are easy to follow and even if I can’t play it I enjoy listening to you play it. I’m a big Duane Allman (Allman Brothers, Dickie, Warren, Derek, etc) fan. Your guitar lesson site tapped into what we wanted to be able to play like these legends. I’ve gotten most of your Duane lessons Cross to Bear, slide and still looking for more. Thanks for all of the work you have done with this Southern Blues Rock style of music that keeps on going and never gets old. I’ve been playing guitar since I was 15. Started on bass and eventually guitar. I’ve learned more from just little things from your Cross to Bear than all the other sites I’ve ever looked into. I’ve wanted to learn how to play slide since hearing Duane play on Derek and the Dominoes album but could never master any of it. Looking forward to this course. Thank you for all your teaching. When I first discovered John’s YouTube lessons I had been trying to teach myself slide for a few years with very limited success. I knew a few chords and could play a few licks, but I really had no idea what I was doing or why. I was so impressed with John’s technique and accessible teaching style that I soon purchased his complete slide guitar course on DVD. Now thanks to John’s well thought out lessons I “see” the fretboard in a completely different way, know where to find major and minor intervals up and down the neck, and feel confident playing slide in any key. I now have the All Access Pass and have learned a great deal about playing in standard tuning as well. I strongly recommend John’s courses for anyone interested in learning, or improving their understanding of blues and/or slide guitar. I started playing slide guitar at 60. Had been a drummer since my teenage years and wanted to play melody. John’s Open E and Open G slide courses allowed me to quickly grasp the techniques and mystery of this style of guitar. I started without any experience in guitar and if not for these courses I suspect I would have given up within the first couple of months. I highly recommend both courses. Spend the enjoyable time with them— and you will be surprisingly competent in a surprisingly short period of time. I have several different courses, and each one has challenged me to bring more discipline to my practice. Being otherwise largely self-taught, the exercises in the courses I own have brought me from new ways to approach basics, such as vibrato and basic slide work, to dissecting the intricacies of Eric Clapton’s fret wizardry. These courses have brought out the “little things” that make a big difference when really communicating the blues. Thanks, John, and here’s to your continued success. I have been playing guitar for 20 plus years and I have found all of John’s lessons to be extremely helpful. I play slide guitar in Open E, Open G and Standard Tuning and the lessons from Learning Guitar Now have given me the tools to take my slide guitar to the next level. If you are new to the guitar or have been playing for many years, these lessons can help take you playing to new heights. Thanks John and LGN! I’m looking forward to more slide lessons in the future. Hi John…. Although I am not that interested in learning slide guitar, I just thought I would take this opportunity to tell you that I think your site is great…. So much info…. I don’t get on it as much as I would like but when I do I really enjoy it and always leave with something new I’ve learned. Keep up this great work…. When my all access pass runs out I will definitely renew. It’s not easy to find experienced teachers in the blues field in France. And when it comes to slide guitar…you’re the only one I have ever found.